Tiziana La Melia was born in Palermo, Italy. In 1987, at the age of five she immigrated to Lake Country, in the interior of British Columbia. She currently lives in Vancouver where she is completing her Visual Arts Degree at Emily Carr Institute. Prior to this she briefly studied English Literature at Simon Fraser University and prior to that in 2002 she studied techniques in 13th century affresco at Palazzo Spinelli in Florence. In the final months of 2007 Tiziana started a writers group known as The Society of August 23rd with several other writers and artists, one of whom is Ada Smailbegovic — the writer for Avowal of What is Here. 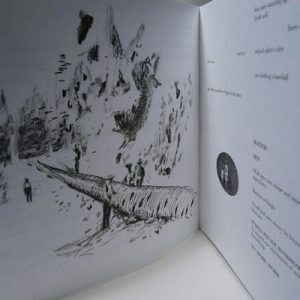 They are now running a reading series, at which Tiziana has been involved in creating poems connected to a series of drawings tentatively titled Legends/Translations.